Forecast: This race originally was carded for the Hillside Turf Course and now will be contested on the main track, so it is best treated with caution. Sir Eddie is good enough off his best speed figure but is a 13-race maiden and probably isn’t one to trust. However, he has hit the board nine times and figures in the fray once again. Appreciated didn’t break well in his debut but then closed with interest to finish second behind a nice colt (Foster Boi) and certainly has a right to improve. Forecast: We’ll go three-deep in the second race, a $12,500 claiming sprint over seven furlongs. Run Macho Run adds blinkers, lands the cozy outside post, and seems primed for a forward move that could be good enough to win this modest affair. The Hollendorfer-trained gelding likes to settle and make a run and should enjoy that type of ride and trip under Franco. Baby Bear’s Trip may be the quickest of the quick and will try to carry his speed an extra furlong today following a good win in the same race that Run Macho Run finished third. The Knapp-trained gelding has won back-to-back races in the past, so he may be able to avoid a “bounce.” Burn Me Twice has the proper style for this extended sprint distance, shows a prior win over the local main track, and should at least get a share. 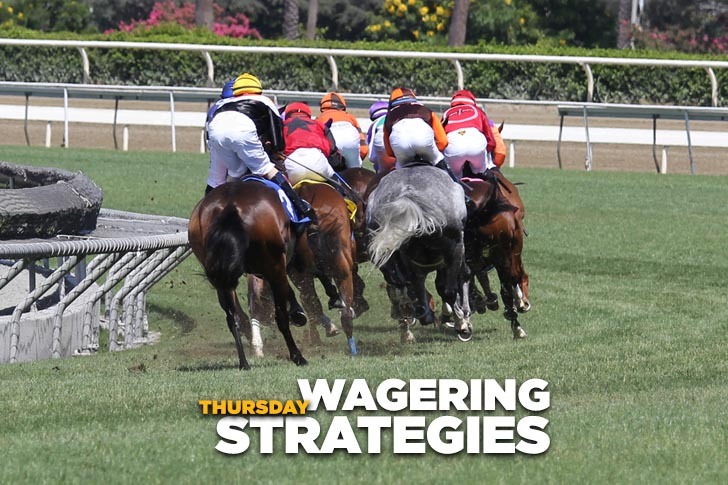 Forecast: ​There’s not much depth to this maiden $50,000 claiming sprint for 3-year-olds, so we’ll try to survive and advance using just two in our rolling exotics. Palaleo has good speed in a field without much of it and should have every chance with a pace-forcing/stalking trip outside. The switch to Prat is a positive move, so we’ll give him a slight edge on top. Railman has burned money in his last pair and is somewhat one-paced, but on pure numbers he’s a fit in a weak race, so we’ll include him on a ticket or two as well. Forecast: Keystone Field has trained well enough to be primed and ready for a winning performance in his first start since November of 2017. Now a 4-year-old but still with plenty of promise, the son of Candy Ride finished an excellent closing fourth in his only prior race, and if he returns as well as he left he’ll handle this assignment. At 3-1 on the morning – we suspect he’ll go lower – he’s a strong straight play and rolling exotic single. Forecast: Cinnamon Twist drops for the money run at this $10,000 claiming level the daughter of First Samurai should be along in time, assuming she has at least one good one left. She was a voided claim last fall at Del Mar, so her condition is a question, but her recent form looks good enough, and all three of her career wins have come over the Santa Anita main track. Periban, who trains ‘Twist, also sends out Party Hostess, who lands the good outside post while being re-equipped with blinkers. She’s also dropping significantly and, like her stablemate, has winning form over this Santa Anita dirt oval. Both should be included in rolling exotic play. Forecast: ​My Mandate graduated with something left in a sloppy track sprint in early February and today stretches out for the first time with a pedigree that suggests he’ll handle the added distance. His numbers are rising, and Van Dyke fits him well. Vantastic lands the rail may try gate-to-wire tactics. His career-top Beyer figure was accomplished when third in a Stakes race on grass at this distance last fall at Del Mar, and a recent bullet workout over the training track indicates the son of Dialed In is doing quite well since finishing third to Stubbins in a downhill dash in early February. Irish Heatwave must overcome the outside draw, but if he can manage to get over and save some ground he could be the most dangerous of the closing types. The son of Unusual Heat broke his maiden over this course and distance last November. Forecast: State-bred maiden $50,000 claimers sprint six furlongs in today’s seventh race, a difficult affair requiring a spread. We’ll use four and hope that’s enough. Perfect Tale, in the money in three of his four career starts, has numbers that are moving in the right direction, retains Van Dyke, and seems as good as any. Sea’s Journey has improving form and may be ready to win after finishing in the frame in his last pair. The Hollendorfer-trained gelding should be on or near the lead throughout. Hard to Come Home, second to a next-out winner in his last outing, won’t have to improve much to beat this field but most avoid trouble from the rail. Friday’s At Shady received no action (20-1) in his debut but closed a huge gap after a slow start to finish second in a good try and certainly has a right to improve. Forecast: This race originally was scheduled for the downhill turf course but has been switched to the main turf and now will be run at a mile. Wandering Patrol has trained superbly for her comeback but we’re not sure if she’ll remain in the race at this new, extended distance. If she does, the daughter of Square Eddie could be long gone on the lead, assuming Cecil believes she’s fit enough to get the trip and therefore doesn’t scratch her. Thalia has been disappointing as the favorite in her last two starts (one of which was an off-the-turf affair), but we’ll give her one more chance after being freshened since December. The works should have fit enough, and a repeat of her maiden win last August makes her strictly the one to beat.